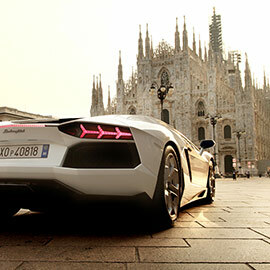 Italian luxury sports car maker Lamborghini is celebrating its 50th anniversary in 2013 by hosting an incredible 700- mile road trip through northern and central Italy in May 2013. Lamborghini, whose sign is the bull, was founded in 1963 by Ferruccio Lamborghini who wanted to create the world’s most beautiful – and powerful – super sports cars. The cars, which sell for hundreds of thousands of dollars, are still made in Sant’Agata Bolognese in the region of Emilia-Romagna. To celebrate the milestone, Lamborghini is sponsoring a 6-day road trip starting in Milan and ending at Lamborghini’s headquarters. Participants can B.Y.O.L, in other words bring their own Lamborghini! Or can arrange for to rent one of the stunning sports cars. The drive will take place predominantly on scenic public roads with legs from Milan to Forte di Marmi (Tuscany), Forte di Marmi to Rome, Rome to Bologna and Bologna to Sant’Agata Bolognese. The full 5-day road trip costs 5,500€ for one car and two people and includes 4- and 5-star accomodations along the route, lunches, dinners, security for the car and much more. Enthusiasts can also sign up for just one leg of the route. Click here for more details. This looks very interesting ! I liked reading the history of perillo tours and I’m also proud of humble beginnings that my family had in the Bronx after immigrating to u.s from Italy. I would like to know if there are any trips with peril tours that do not include flights as I’m scared to fly ! please email me at I would love to travel more.